This recipe for 'Egg Exchange' is a natural, healthy recipe for homemade, no-cholesterol 'egg substitute'. It uses only the egg white with some added polyunsaturated oil to copy the taste and texture of whole eggs. The added oil is 'good' fat, which helps lower cholesterol levels in the body (saturated fat raises blood cholesterol levels). Place egg whites in a medium bowl. Whisk in oil, salt and food coloring, if desired, just until blended. 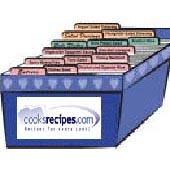 Refrigerate mixture in a tightly covered container for up to 4 days. Use 1/3 cup for the equivalent of 1 whole egg. When separating eggs, use an "egg separator" - never the shell. Bacteria from hands and other sources are still present on the shell and can be easily transferred to the egg recipe you're preparing. Recipe may be halved, doubled or tripled. Nutritional Information Per Serving (1/6 of recipe; 1 serving = 1/3 cup): Fat 2 grams; Calories 53; Saturated .3 gram; Protein 7 grams; Unsaturated 1.7 grams; Carbohydrates 1 gram; Cholesterol 0 mg.